check our Calendar to see when the next event will be. 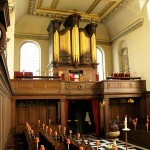 This is the fourth home for St Vedast’s marvellous Harris and Byfield organ, dating from 1731. 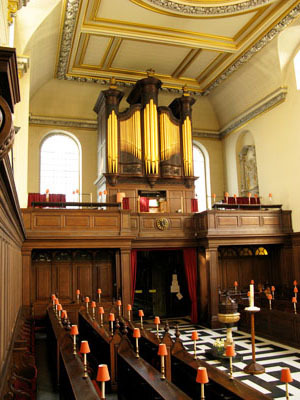 Having been created for St Bartholomew by the Exchange (since demolished to make way for a Bank of England extension), it was then installed in a church in east London, and then one in Fulham. Noel Mander, the well-known 20th century organ builder who served as a churchwarden at St Vedast after WWII, rescued it and restored it to use here, using some of the stops and most of the original pipes. Manders still tune and maintain the organ regularly. The Director of Music, Joseph Ramadan, conducts and plays for Sunday services as well as for many of the special services held in the church through the year. Concerts and recitals can be held at St Vedast, and a number of choirs rehearse in the church. A baby grand piano is available for concerts and rehearsals. We also host musical and other events at St Anne & St Agnes, which is very near St Vedast and is located on Gresham Street, London EC2V 7BX. St Anne & St Agnes, also known as the Gresham Centre, has become the home of Voces Cantabiles Music, an education project of the vocal ensemble Voces8.